Bicycling Magazine is the world's premier road and mountain biking publication, packed with the practical tips needed to make every ride more enjoyable. Bicycling magazine offers information on where to ride, how to train, health and fitness tips, and equipment reviews. 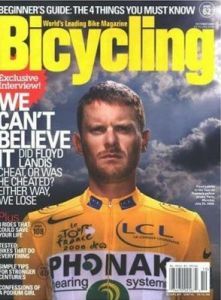 We currently do not offer BICYCLING MAGAZINE SUBSCRIPTIONS.